Ragachak: There aren’t as many mobile games doing huge world tournaments the way Summoners War is right now. Was there any fear that a mobile game doing a massive world tournament wouldn’t catch on? Casey: No, there was never really any fear that doing a massive world tournament would not catch on, as our goal was never to position ourselves as one of the leaders in the mobile esports space. Rather, these tournaments were planned as a means of giving back to our community. We provided a platform for our top players to compete and an environment in which our fans would be able to interact with the IP as well as our influencers, in turn providing entertainment and a new means to interact with the brand to our community and fans. We were surprised and delighted to see such positive feedback and response with the world tournament and it is an area we will continue to grow in as we develop the brand and IP. Ragachak: We saw the Guild vs. Guild matches during the Americas Cup and from what I understand, it was just a “test”. Has there been any more discussion on if Guild vs. Guild will be coming to Summoners War? Casey: Definitely! We received great feedback as The Guild vs Guild battle was very successful both internally as well as in the community. It provided a new dynamic where the sum of the parts through strategy and execution would be able to overcome match-ups that were otherwise more difficult in the single player battle scenario. We are always looking for new ways to entertain our user base so whether this content will be a permanent fixture in the game or if we go a different route has not been determined. But again we are just having fun with our community and if we can create something even more entertaining then that is what Summoners War will follow. Ragachak: Speaking of new modes, has there been any discussion about group vs. group, where each player brings one monster to a squad to battle another squad of monsters? Casey: We discussed this as well as a wide range of other game mode options internally, but it takes quite some time to test and finalize. As with the Guild vs. Guild battle, we had to make sure balancing was right and flow was precise for us to implement and test during the SWC Americas Cup and World Finals. Although we have had discussions in the past, it’s too early to finalize this early on but there is always a possibility for more group battle content. Casey: One of the most impressive and surprising elements of the tournament was how many farmable units made appearances. Jeanne (the Light Paladin), Tesarion (the Fire Ifrit), and Chilling (the Water Jack-o’-lantern) all showed up in the pick/bans. Not to mention Veromos (the Dark Ifrit), one of the first Monsters players try to obtain through Fusion, also showed up as a counter-pick to Jeanne. The Light Paladin was chosen in 16 out of 22 games during the single-player portion of the tournament and the Water Jack-o’-lantern was selected nine times. But if you’re looking for a great set to watch with the most unique team compositions, Matsu vs Beat.D was definitely a highlight. Ragachak: Any big news or teasers coming out of Worlds that you think our audience would enjoy hearing? Casey: We have quite a number of big updates coming soon and in fact gave an exclusive first look at the new short film we have in the works in partnership with Skybound Entertainment to those tuning into the SWC 2018 World Finals. We have been making continued investments into expanding the Summoners War universe through story building, animations, comics, and licensed products, and have partnered with top industry leaders to make that possible. 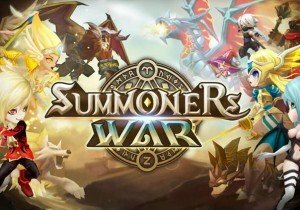 We are collaborating with Robert Kirkman, creator of The Walking Dead, and Catherine Winder, who produced the Angry Birds Movie and Star Wars: Clone Wars, to capture the true essence of the Summoners War game on screen. We’ve also partnered with Funko Pop to bring several iconic Summoners War characters to life. It’s only fitting that Jeanne, the most used Monster during the SWC World Finals, joins a cast of fan favorites in Orion, Camilla, and Mav to be featured as the first 4 figures in the line up. Ragachak: What does the future hold for Summoners War? Where do you want to take it next? Casey: As I mentioned, we are trying to build up the IP of the Summoners War universe. We are actively seeking opportunities to help expand the brand beyond just a mobile game. Whether its through game content, animation, licensed products, merchandise, world tournaments or festivals, everything we are doing is towards building our community and providing news ways for them to experience and fall in love with the brand. En Masse Entertainment has announced today that from March 6th through March 14th, players can vote on the next Wolf Dog in Closers. A lot has changed since that time; the game is now officially on Steam and available for early access play. Blitz Brigade Squads - Who's got your back?